Circa 1815 Cover to Ludlow showing a SHIFFNAL/146 mileage, SH 534. 1828 Entire to Ludlow showing a superb boxed Shiffnal/P.y Post in BLUE, SH 552. Also on the front is a boxed No3 Receiver in Red of Wenlock. 1791 Entire to Bloomsbury, London with, on the front, a very fine Two-line SHREWS/BURY, SH 638. 1897 ½d Brown Newspaper Wrapper from SHREWSBURY to WORTHING inscribed "Book Post" and uprated with a ½d Vermilion, SG 197 - this was STILL UNDERPAID AND IN LONDON A FRAMED "More to pay/above 4 oz/NPB" and "N.P.B./1D" POSTAGE DUE APPLIED. Attractive. 1841 1d Mulready Letter Sheet, Forme 2, Stereo A25, addressed to Newport and cancelled by a fine WELLINGTON, SALOP Maltese Cross. Circa 1767 Cover addressed to "Rolls Coffee House", London with, on the reverse, a straight-line "SALOP." WITH FULL STOP, SH 596. 1857 1d Red-Brown tied to envelope to Ludlow by a very fine Bridgenorth Spoon duplex, Code A. 1852 Cover to Ludlow with, on the reverse, a LUDLOW CIRCULAR-FRAMED SKELETON DATESTAMP in Blue, SH 269. SCARCE - Recorded 1852 only, 10 Dec to 24 Dec.
1830 Cover to Drayton showing a superb boxed MISSENT TO/SHREWSBURY. 1858 Envelope addressed to Shrewsbury franked by a 1d Rose-Red, SG 40, and tied by a very fine Bridgenorth Spoon cancellation, Code B. 1859 1d Pink envelope to Llanwrst cancelled by a fine OSWESTRY Spoon duplex, Code B. 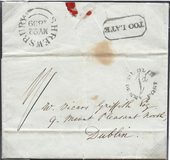 1858 Envelope to Ludlow franked by a 1d Rose-Red, SG 40, tied by a very fine BRIDGENORTH Spoon duplex, Code B. 1844 Entire to Carshalton showing on the front a fine Type 5 RUYTON/PENNY POST, SH 481. 1849 Envelope to Withington near Manchester showing on the front very fine WITHINGTON and BROSELEY (SHIFFNAL) Undated Circles. 1828 Entire to Bewdley showing a very fine Type 2 SHIFFNAL/PY. POST in Blue. 1817 Entire to Ellesmere showing a fine SHIFFNALL/PENNY POST, SH 550. 1855 Envelope to Cromer showing on the reverse a very fine COALBROOKDALE (under Wellington, Salop) undated circle. 1838 Cover to Ludlow showing a Type 5 IRONBRIDGE/PENNY POST, SH 182 and BROSELEY undated circle, SH 94. 1788 Entire to Ludlow from GRAY'S INN COFFEE HOUSE, LONDON". 1846 Envelope addressed to "NEW HUMMINS", (Coffee House), Covent Garden from Ludlow. 1797 Entire from Ludlow addressed to "GRAYS INN HOTEL" (Coffee House), London. 1884 1d Lilac, SG 172, tied to envelope to Edinburgh by a Shrewsbury 703 duplex and showing on the reverse a fine EDINR. & CARSTAIRS SORTING TENDER, W 714, No Index. 1905 Postcard to York franked by a ½d, SG 218, tied by a very fine BRISTOL SHREWSBURY & YORK T.P.O./FROM.EAST, W 116. Very Scarce. 1839 Entire from Shrewsbury to Dublin showing a SHREWSBURY boxed "TOO LATE" and a fine circular DUBLIN/≀d/PENNY POST. 1775 Cover to London with, on the reverse, a very fine two-line SHREWS/BURY and London Bishop mark for 1/AP, SH 604. 1861 1d Rose-Red, SG 40, tied to envelope to Ludlow by a very fine BRIDGENORTH 'SPOON' duplex, Code B. 1845 Prepaid entire to Wenlock with, on the front, a very fine BROSELEY (under Wenlock) undated circle. 1831 Cover to Ludlow showing a fine boxed SHIFFNAL/PY POST in blue, SH 552. 1849 Envelope to Ludlow with, on the reverse, an ASTON undated circle in black and a very fine "LUDLOW/MY 19/1849/3" Skeleton datestamp in blue. 1839 DEC 23rd Cover to Wem showing a very fine MARKET DRAYTON UNIFORM MANUSCRIPT '4' in black. 1834 Entire to Derby with, on the reverse, a fine MARKET DRAYTON with mileage removed in red, SH 310. Circa 1772 FREE cover to Ludlow from London showing a very fine 21mm circular-framed FREE, L767 - "Thos. free Hill". 1863 1d Rose-Red, SG 40, tied to Envelope to Shrewsbury by a superb BRIDGENORTH 'Spoon' duplex. Superb! 1912 Postcard from Germany to Market Drayton, Shropshire, showing a superb NORTH WESTERN T.P.O. DAY MAIL 'NW/TPO/M' in diamond framed in Red, W 24. 1864 Envelope from Edinburgh to Newport showing on the reverse a very fine boxed 'SHREWSY & TAMWORTH/R.P.O. in black, W94. 1767 Entire from the "ORPHAN HOSPITAL SALOP" addressed to the "FOUNDLING HOSPITAL LONDON" showing a very fine SALOP, SH 596. Contents refer to three apprenticed children. 1858 1d Pink Stationery Envelope to Newport cancelled by a superb Type C2 SHREWSBURY Spoon duplex, Code D2. 1858 1d Rose-Red, SG 40, tied to Envelope to Ellesmere by a SUPERB OSWESTRY Spoon duplex, Code B. 1861 1d Rose-Red, SG 40, tied to envelope to Ludlow by a fine BRIDGNORTH Spoon duplex, Code B. 1857 1d Pink Stationery Envelope to Ludlow cancelled by a fine Type B SHREWSBURY Spoon duplex, Code D2. 1873 Envelope from Wellington, Salop to San Moritz, Switzerland showing a very fine INSUFFICIENTLY/PREPAID and Red Crayon Arrival Charge; also showing a very fine (London F.B.?) VIA ALSACE in black. VERY RARE AND ONE OF THREE RECORDED. 1805 SOLDIERS LETTER from PERTH to LONDON endorsed by "CAPTAIN R LOWRIE 91 REGt." - ABUSE OF PRIVILEGE as contents are from the wife of Private Daniel Forbes and NOT entitled to the 1d CONCESSION. Examined by a Postal Clerk and charged Full Civilian Rate of 1/9d. Ex G Sattin.